Interstate 535 is a short freeway linking Interstate 35 and U.S. 53 in Duluth, Minnesota, with 3rd Street and Hammond Avenue in Superior, Wisconsin. The route spans Howards Bay and the St. Louis River between Connors and Rice’s Points along the John A. Blatnik Bridge, a continuous steel through truss arch bridge. MnDOT is in charge of maintenance for the Blatnik Bridge on I-535 & U.S. 53 while WisDOT is responsible for maintenance of the Bong Bridge (U.S. 2) to the south. Costs are split between the two states. Interchanges along Interstate 535 are unnumbered. The west end ties into Interstate 35 and the U.S. 53 expressway leading northwest at the locally named “Can of Worms” interchange. The junction involves two directional T interchanges, with a signalized turn from I-35 north onto U.S. 53 north across the U.S. 53 southbound lanes leading to I-535. Looking southeast from Enger Park at the “Can of Worms” interchange and Interstate 535 & U.S. 53 leading south along Rice’s Point to the Blatnik Bridge. Photo taken by Monte Castleman (07/02). Costing between $250-275 million, the Twin Ports Interchange program will replace 33 bridges and update the interchange joining I-35, I-535 and U.S. 53 in Duluth and revise the ramps along Interstate 535 at Garfield Avenue. Both interchanges serve the Clure Public Terminal, but weight restrictions currently in place force overweight vehicles to and from the port onto local streets. Design work will be completed in mid-2019, with construction following through 2022. Also known as the Can of Worms interchange in part due to the third-highest crash rate in Minnesota, the exchange between I-35/535 was built in the 1960s utilizing elevated roadways and ramps due to poor foundation soils. Deterioration to the bridges resulted in the overweight truck detours currently in place. Further south at Garfield Avenue, weight restrictions also apply to the interchange built there in 1969. The MnDOT FASTLANE Grant application for the Twin Ports Interchange 2020 program estimated $244 million for the preferred alternative, with a time savings of 14 years. A previous alternative called for maintaining the existing facilities and replacing elements piecemeal over an 18 year period using traditional funding sources.6 Redesign of the Can of Worms interchange includes relocating the Interstate 35 mainline so that each roadway runs next to one another in place of the current wide median. This will allow for the relocation of left exits to right exits and eliminate merge conflict points. Additionally a value engineering study analyzed whether the I-35 mainline could be rebuilt entirely on embankment versus on elevated viaduct. The signalized movement from I-35 north to U.S. 53 north however will remain. 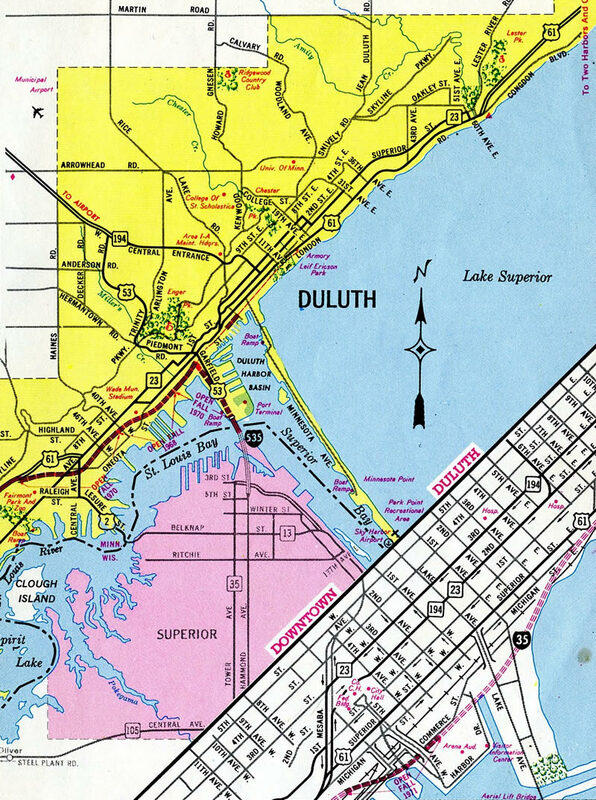 Interstates 35 and 535 proposed through Duluth – 1968 Wisconsin Official Highway Map. U.S. 53 traveled Garfield Avenue north to Piedmont Avenue west to the current alignment along Trinity Road prior to the completion of the freeway ascending west by the Goat Hill neighborhood. Interstate 35 opened in conjunction with I-535 leading west from the Can of Worms in December 1971.2 The freeway opened east to Mesaba Avenue soon thereafter. Overall completion of I-35 however, was delayed until 1992. Two wye interchanges join Interstate 535 & U.S. 53 with Garfield Avenue (historic U.S. 53) by the Port Terminal. The freeway continues one mile to I-35. Photo taken 06/14/15. Interstate 535 & U.S. 53 swing west along the shore of St. Louis Bay to the Can of Worms interchange with Interstate 35. I-35 extends four miles north to end at Minnesota 61 (London Road). Photo taken 06/14/15. A large BNSF Railroad yard appears along the east side as I-535 & U.S. 53 prepare to separate into single lane ramps for Downtown, Lincoln Park and Spirit Valley in Duluth. Photo taken 06/14/15. Flyover ramps shuttle motorists over BNSF Railroad lines to both I-35 north toward the North Shore and the continuation of U.S. 53 north to Duluth Heights. Photo taken 06/14/15. A left exit follows onto Interstate 35 south to Minneapolis and St. Paul while U.S. 53 curves west and north to 21st Avenue West and Piedmont Avenue. Photo taken 06/14/15. The first guide sign for Interstate 535 south (Exit 255B) appears as Interstate 35 enters the diamond interchange (Exit 254) with 27th Avenue West. Photo taken 06/14/15. Ramps depart I-35 north simultaneously for U.S. 53 north (Exit 255A) and I-535 & U.S. 53 south (Exit 255B) at the freeway enters the Can of Worms interchange. I-535 and U.S. 53 are linked seamlessly above, as U.S. 53 winds westward as an expressway to overtake Piedmont Avenue across the Lincoln Park street grid. Photo taken 06/14/15. These guide signs with centered exit tabs were replaced during 2011 road work to reconstruct I-35 through Duluth. Photo taken by Patrick Lilja (07/04/05). These signs were also replaced during construction at the Can of Worms interchange. Note the older style guard rails on the adjacent ramps as well. Photo taken by Patrick Lilja (07/04/05). A wye interchange adds traffic from parallel Michigan Street (old U.S. 61) and Superior Street as Interstate 35 southbound approaches Interstate 535 south and U.S. 53 (Exits 255B/A). Photo taken 06/14/15. Two lanes merge onto I-35 south from Michigan Street to expand southbound freeway to three lanes. A lane drop occurs in one half mile for I-535 & U.S. 53 south. Photo taken 06/14/15. A flyover takes motorists onto Interstate 535 & U.S. 53 south to the Blatnik Bridge into Superior, Wisconsin. A right-hand ramp follows in one fifth of a mile for the U.S. 53 freeway north and its ramp for adjacent 21st Avenue West. Photo taken 06/14/15. U.S. 53 transitions to a freeway south of West 6th Street as it lowers through the Lincoln Park neighborhood of Duluth into the Can of Worms interchange with Interstates 35 and 535. Photo taken 06/14/15. An on-ramp joins the U.S. 53 viaduct from 21st Avenue West as the freeway approaches the off-ramp for Interstate 35 south to Minneapolis and St. Paul. Photo taken 06/14/15. Traffic remaining along U.S. 53 south to Interstate 535 encounters a signalized intersection with the northbound off-ramp from I-35 to U.S. 53 north. A traffic signal between an Interstate and other freeway is not unique to Duluth, as the scenario plays out on Interstate 229 at U.S. 36 in St. Joseph, Missouri as well. Photo taken 06/14/15. U.S. 53 separates into single lane ramps for both Interstate 35 north to Downtown Duluth and the North Shore and the continuation onto I-535 south to Superior, Wisconsin. Photo taken 06/14/15. A reassurance shield assembly appears for I-535 & U.S. 53 south as the freeway runs along side a BNSF Railroad yard at Rice’s Point. A Canadian Pacific yard lines the east side of the freeway at the forthcoming exit for Garfield Avenue (old U.S. 53). Photo taken 06/14/15. Bridges associated with the Can of Worms interchange were overhauled as part of the I-35 Mega Project completed in spring 2012. This view looks at the old guard rail structure at the directional T interchange. Photo taken by Jeff Royston (10/00). Interstate 535 & U.S. 53 lower from Howards Bay to a loop ramp with North 3rd Street at Hughitt Avenue. Wisconsin 35 commences a 412-mile route there south to the Illinois state line at Kieler. Photo taken 06/14/15. U.S. 53 leads away from I-535 at North 3rd Street. 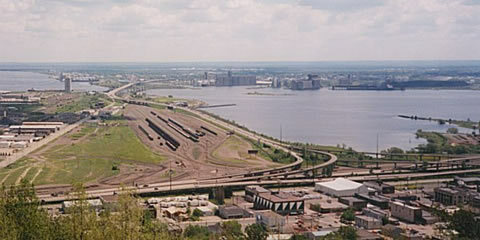 The US highway follows East 2nd Street, a four-lane boulevard running along the west bank of Superior Bay to East End in Superior. Photo taken 06/14/15. Interstate 535 transitions into Hammond Avenue south as U.S. 53 departs for North 3rd Street and STH-35. STH-35 takes Tower Avenue south to Downtown Superior. The route formerly was a part of U.S. 53 Business. Photo taken 06/14/15. An end shield for Interstate 535 stands at the intersection of Hammond Avenue and North 5th Street. U.S. 2 crosses Hammond Avenue ten blocks ahead via Belknap Street. Photo taken 06/14/15. The previous end I-535 shield assembly was coupled with a small guide sign. Photo taken by Jeff Royston (10/00). U.S. 53 (East 2nd Street) veers west from the industrial Superior Bayfront to meet both the south end of Interstate 535 and north end of STH-35. Wis 35 circles northward to pass under the Blatnik Bridge en route to Downtown Superior. Photo taken 06/14/15. U.S. 53 proceeds through a signalized intersection to merge onto Interstate 535 north across Howards Bay and Connors Point into St. Louis County, Minnesota. Photo taken 06/14/15. Wisconsin 35 curves east from Tower Avenue onto North 3rd Street to meet Interstate 535 and U.S. 53 a a pair of loop ramps below the Blatnik Bridge. U.S. 53 south joins North 3rd Street from the I-535 freeway end above. Photo taken 06/14/15. Wisconsin 35 ends as U.S. 53 north joins I-535 from East 2nd Street to Duluth, Minnesota. Wis 35 is the longest trunk highway in the state. Photo taken 06/14/15. 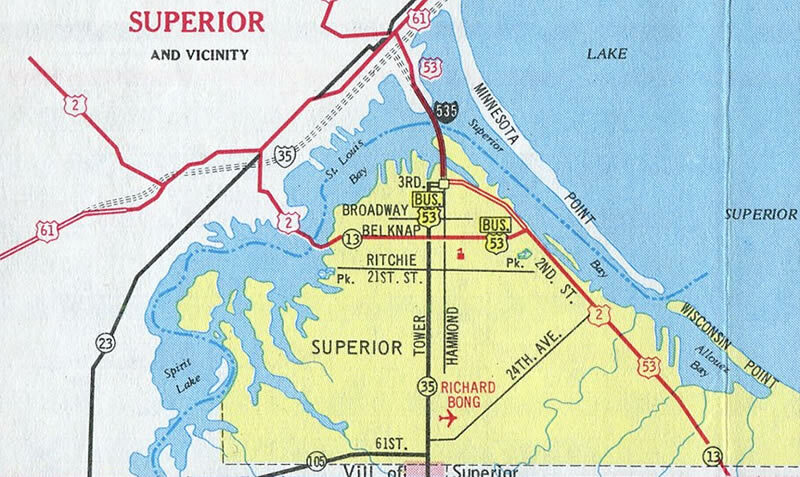 Interstate 535 & U.S. 53 run north to Rice’s Point and Lincoln Park in Duluth, where they meet Interstate 35. U.S. 53 south meanwhile combines with U.S. 2 on their southeast trek to Amnicon Falls. Photo taken 06/14/15. Hammond Avenue extends north with one lane onto the beginning of Interstate 535 from North Fifth Street. A reassurance marker stands along the transition to the Blatnik Bridge. Photo taken 06/14/15. “Interstate Openings.” Minnesota Highways, January 1972: 8. Print. “Load limit signs posted on Blatnik Bridge.” Superior Telegram, November 21, 2011. Interstate 535 John A. Blatnik Bridge, Fact Sheet. 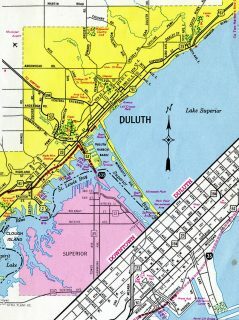 Minnesota Department of Transportation – District 1 – Duluth, March 2012. “Bong Bridge reopens with lane restrictions in time for Blatnik inspections.” Superior Telegram, October 30, 2015. Twin Ports Interchange 2020 – FASTLANE Grant Application – Minnesota Department of Transportation. http://www.dot.state.mn.us/d1/projects/twin-ports-interchange/images/TP-FASTLANE-Grant.pdf April 14, 2016.